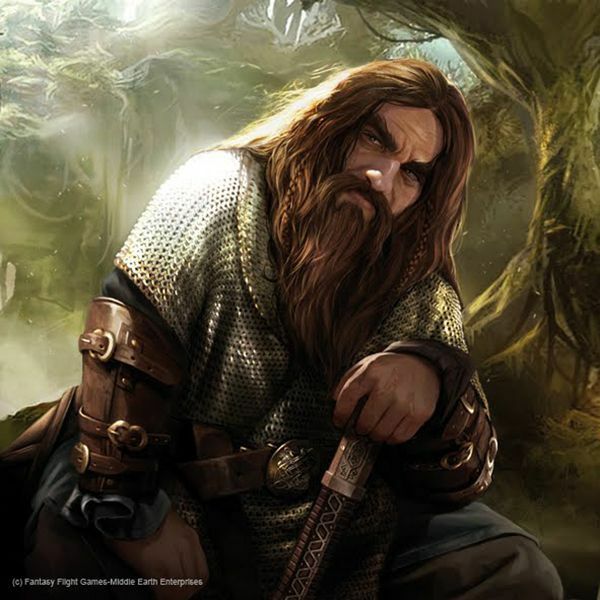 Gimli was a dwarf of Durin's Folk, a direct descendant of Durin the Deathless through Náin II's younger son Borin, and in turn Farin's younger son Gróin, and his younger son Glóin. 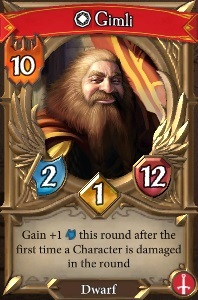 Despite being too young at the time of the Quest of Erebor (only 62), he became famous as the only Dwarven member of the Fellowship of the Ring. Gimli was born in the Blue Mountains 109 years after the tragic destruction of Dale and the Sacking of Erebor by Smaug the Golden. He was forbidden to join Thorin and Company because of his age: only 62 at the time. Years later, in T.A. 3017, Gimli witnessed the tempting offers of the messenger of Sauron (presumed to be a Nazgûl) concerning the Ring of Power, and accompanied his troubled father to Rivendell for the dual purpose of warning old acquaintance Bilbo Baggins and seeking the counsel of Elrond on such weighty matters. He attended the Council of Elrond as a representative of the Dwarves of Erebor. He was quite helpful to Gandalf in explaining the Doors to the other curious members of the fellowship. Gandalf showed his appreciation of Gimli’s skills by letting him walk up front through the dark tunnels beside himself, and taking brief counsels with him when the way is unsure. It is probable that here Gandalf is tapping into Dwarven inborn or developed skills rather than actual knowledge of Moria itself, as Gimli had never personally been there. Gimli reacted most indignantly to Sam’s suggestion that Moria was but 'holes', going so far as to chant for him the ancient Song of Durin. 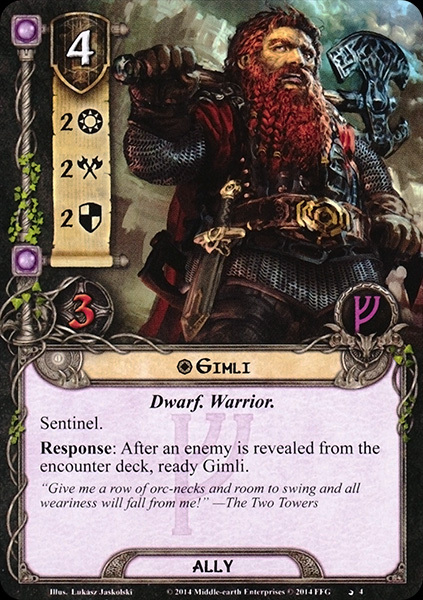 Gimli continued to be helpful to Gandalf on the rest of the dark passage, and boldly aided in the Battle of the Chamber of Mazarbul, protecting Balin’s tomb. After Gandalf remained behind to halt the Balrog, Gimli led the others across the Bridge of Khazad-dûm. He again shows great emotion when they near Kheled-zâram, taking Frodo alone out of all the company with him to see it (though Sam follows as well). This hints at a degree of affection for Frodo, though it may merely be because he was the most important of the company. Despite his helpfulness, at Lothlórien he became the greatest hindrance to the Company, when he alone was required to be blindfolded and of all of them liked the idea the least (save for perhaps Legolas). The compromise was made that the entire company would go through the Golden Wood in this manner, that Gimli would not suffer alone. Despite this early struggle, it is Gimli of all the company that is most remembered for his deeds in Lothlórien. For his heart softened towards Galadriel and as a result toward Elves in general when that great lady sympathized with his sorrows, using the traditional Khuzdul names. In return he attempted to compliment her, as he saw her love and understanding. Though slightly clumsy in his first attempt, he distinguished himself when, as Galadriel gave the Company gifts, he asked only for a single strand of her hair. Galadriel gave him three hairs with a blessing, probably remembering when Fëanor had requested a similar gift several millennia ago. Henceforth Gimli was known as 'Lockbearer'. He wept openly at the departure from Lothlórien, calling the light more dangerous than the darkness he had feared. After the Breaking of the Fellowship, during which he and Legolas slew many orcs, Gimli listened in silence as his only remaining comrades, Aragorn and Legolas, sang a lament for Boromir in the character of three of the Winds. Only the East Wind was left, and Gimli would not sing it, which Aragorn declared to be appropriate. For most of the chase he served as a commentator, usually leaving the decisions to Aragorn. His reaction was quite hostile to the suspicious Rohirrim, especially after Éomer’s rash comments about Galadriel. Little did either know that they would become close friends in the times to come as fiery words passed between them. After the Three Hunters were lent horses, Gimli and Éomer parted in peace, with promises to one another of reconciliation. Of the Three Hunters, Gimli seemed the most shaken by Fangorn Forest while they searched for traces of Merry and Pippin. Gimli felt no reluctance to shoot the 'unarmed' old man whom they thought was Saruman, unlike Aragorn and Legolas. After Gandalf was revealed to them, Gimli fell to his knees. Gandalf put his hand on Gimli’s head, and the dwarf laughed for the first time recorded during the Quest of the Ring. Gimli’s ire was raised again in King Théoden’s courts against Wormtongue, who spoke slanderously of the Lady of the Golden Wood. Gandalf quickly calmed him. Gimli was delighted by the White Mountains and Helm's Deep, declaring 'This country has tough bones'. He declared that if he had a hundred of his kin he could make the fortress invincible. During the Battle of the Hornburg, Gimli saved Éomer’s life outside the gates. He came in, boasting of his first two orc-kills to his friend Legolas. Legolas estimated his slaughter to amount to twenty, starting the good-hearted orc-killing game that continued through the rest of the battle. Gimli was the first to the culvert when the orcs crept through, leaping heroically into their midst from the walls. He then proceeded to lead the blocking up of the culvert. 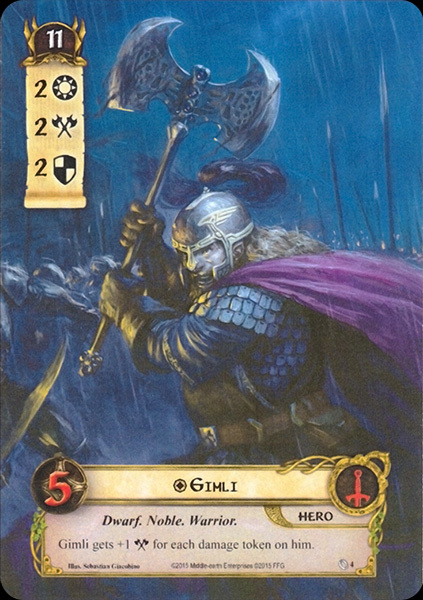 During the course of the battle Gimli was one of those forced into the Glittering Caves. He was astonished to see the magnificence of these caverns, moving even Legolas with his glowing description of them. This one sight would change his life. His final kill score number was forty-two in that battle, surpassing his friend the elf by one. Gimli shows a hint of humor and affection when he greets the two Hobbits Merry and Pippin comfortably situated among flotsam and jetsam in the ruin of Isengard. He declared himself deep in Pippin’s debt when the hobbit lent him his spare pipe. He participated in the epic Battle of Pelennor Fields, returning with Aragorn and his other companions on the Black Ships, and later recounted their journey to the fascinated Hobbits. He began to fear for Legolas, who seemed entranced by the Sea. His position on Elves completely changed, he remarked “If all the fair folk take to the Havens, it will be a duller world for those who are doomed to stay”. He was much more sceptical as to the overall end of Men than his comrade. Gimli fought in the Battle of the Morannon, passing through unscathed, and finding the alive but bruised Pippin among the dead lying on the hill. He returned to the Field of Cormallen to be reunited to his friends, and there displayed open affection for all of them, even his frequent rival Pippin ('If only because of the pains you have cost me, which I shall never forget'). During the return journey he visited many places with Legolas, including Fangorn Forest and Aglarond. Eventually he returned to Erebor, to find it nearly devastated by war. Dáin II Ironfoot had died, and Thorin III Stonehelm was now King. Eventually, though, he returned to the Glittering Caves with a contingent of dwarves, becoming the 'Lord of the Glittering Caves'. He rebuilt the gates of Minas Tirith with mithril and steel, and in both Gondor and Rohan accomplished great works. In Aglarond, it is assumed, he lived on until he was old, and in Fo.A. 120 he sailed with Legolas his friend across Belegaer to Valinor, becoming the first and only Dwarf to do so. 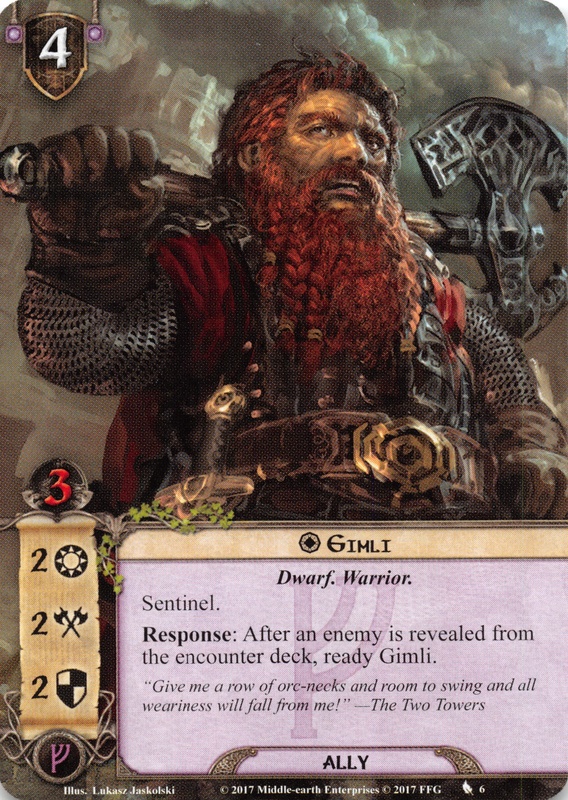 In 1978, Jim Allan noted that the name Gimli appears once in the Völuspá and three times in the Prose Edda. 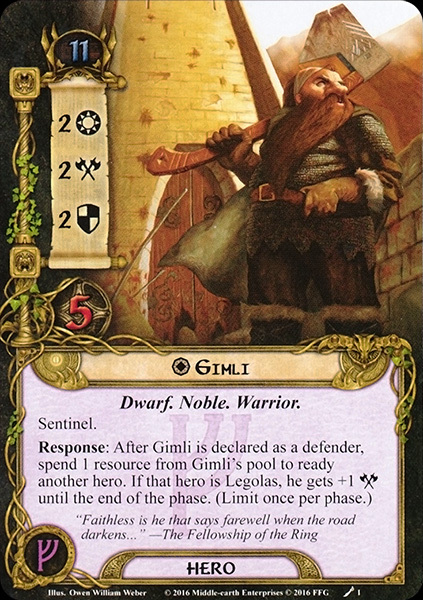 Allan suggested that Gimli means 'One-of-Gimlé/Gimill', where Gimlé/Gimill in the Eddas is a hall of the after-life 'inhabited solely by Light-elves' (evoking Gimli's leaving for Aman). However, with the publication of The Letters of J.R.R. Tolkien in 1981, Tolkien wrote in a draft letter that Gimli's name comes from a poetic Old Norse word, gimm, presumably meaning 'fire'. 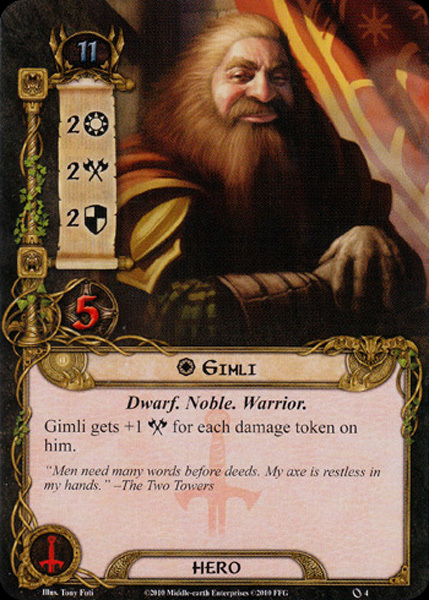 The name 'Gimli' was first used by Tolkien for the name of a Gnome in the Tale of Tinúviel, written in mid-1910s. In the Adûnaic language described in The Notion Club Papers (1945), gimli (pl. gimil) is the word for 'star', derived from a root G-M-L and having the Characteristic Vowel I. From these derive others words such as igmil 'a star-shaped formation'; and Gimilnitîr 'Star-kindler' (Gilthoniel), a name for Varda.